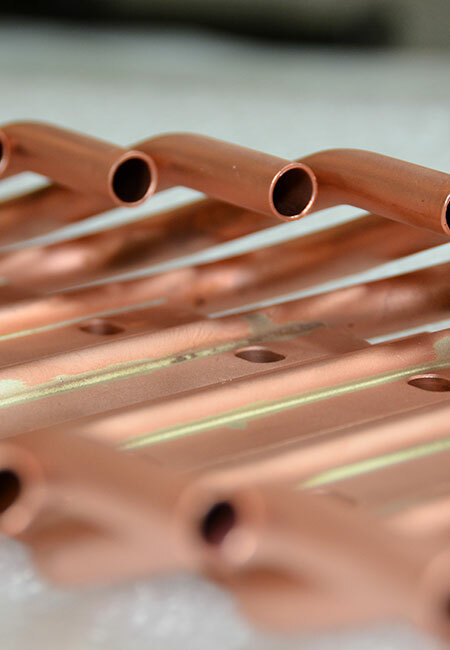 We offer certified metal tube brazing services with copper and stainless steel tubing for a variety of industries, whether you need torch brazing or furnace brazing services. We can braze most metals together, regardless of whether they are similar or dissimilar metals. Tube brazing services are performed with a torch instead of a tungsten gas, adding silver to braze two pieces together and create a leak-free joint. Tube brazing is also used to remove parts from a system that can be reused in a different manner where necessary. During the tube brazing process, heat is applied to the metals to be joined, causing expansion to take place. Filler metal is then placed in the expansion area, and capillary action takes place between the mating metals and the filler metals. The filler metal becomes a liquid and flows naturally into the small crevices of the weldment (also referred to as capillary action). All parts to be used in the tube brazing process must be cleaned before and after brazing takes place. In addition, fluxes are applied in order to protect the molten metal from the atmosphere, and to aid in capillary action. Fluxes also help to clean the metals during the process. Our highly trained and certified technicians are well-qualified to perform high purity metal welding across several industries. Each technician is certified to the processes which they perform, and every one of our production staff is cross trained for orbital welding. All of our hand welders are certified as well. The skill level required is lower than that of welding, as there is no certification required to perform tube brazing. It is not as clean a process as welding, but it does allow for parts to be removed from a system and reused, and allows for mistakes to be undone. Tube brazing can be as strong as welding, but welding is typically considered to be stronger joining process overall. Tube brazing is just one example of Axenics’ many capabilities. Contact us to find out what else we can do for your business.